Introduction: Presently, it is admitted that individuals with reading and writing alterations may present delay in the development of listening skills, which may interfere in the learning process. The assessment of the listening skills can occur in a behavioral way, through central auditory processing (CAP) tests, or by electrophysiological assessment highlighting the long latency auditory evoked potentials (LLAEP). The use of the LLAEP as a means of complementary assessment of individuals with reading and writing alterations can become an important data both for further characterization of the alterations, as for the therapeutic guidance of this population. Objective: Characterize the CAP and the LLAEP in children with reading and writing alterations. Method: Research approved by the Institution's Ethic Commission under nº 305/10. The assessment of CAP and LLAEP was performed in 12 children aged between 8 and 12 years old (average of 10,6 years), with reading and writing alterations confirmed in specific evaluation. Results: The most altered CAP skills were temporal ordination and figure-ground for linguistic sounds. There were found altered results in P300 and in MMN. Conclusion: The individuals with reading and writing alterations performed below the expected on CAP tests. The MMN allowed a better characterization of the auditory function of this population. There was evidence of association between the CAP results and the alteration of the LLAEP. The alterations in reading and writing are characterized by the difficulty to acquire and/or develop the written language, including a deficit in phonological decoding as well as in oral and/or written language comprehension (1). Currently, it is assumed that individuals with reading and writing alterations may present delay in the development of auditory skills, preventing the regular information processing and interfering in the learning process (2). Various studies (3, 4, 5) correlate changes in reading and writing skills as possible disorders of the (central) auditory processing (CAP). Researches (6, 7) indicate that, among the comorbidities that commonly show changes in the CAP, the learning disorders are the most frequent. The difficulties are in the processing of temporal characteristics of stimuli from different sensorial modalities, when presented quickly and in sequence (8). It is noteworthy that the assessment of the auditory skills may occur in a behavioral way, through CAP tests, or through electrophysiological evaluation, which reflects mainly the activity of the auditory pathway in the face of stimuli from the brainstem region to the cortex region, also enabling the assessment of the abilities of sequential processing of information, immediate memory and/or decision making (9, 10). On the spectrum of electrophysiological assessment of hearing, it is highlighted the investigation of long latency evoked auditory potentials (LLEAP). The LLEAP reflect the neuroelectric activity of the auditory pathway in the regions of the thalamus and auditory cortex, structures that gather the functions of discrimination, integration and attention, providing information on the functioning of the Central Auditory Nervous System (CANS). The P300 and Mismatch Negativity (MMN) auditory evoked potentials are of long latency (LLAEP) as appear between 80 and 750 ms (11) after the stimulus presentation and capture responses generated in cortical regions. They are elicited in oddball tasks (target stimulus), at the discrimination of two different stimuli, one being presented frequently and the other introduced randomly, called rare stimulus. These potentials are used in the investigation of cognitive abilities such as discrimination and attention, therefore being called cognitive potentials. The use of LLEAP as additional assessment of individuals with alterations of reading and writing may become an important data both for further characterization of the changes, as for the therapeutic guidance of this population. However, there are still few studies in national literature that investigate beyond the behavioral aspects of CAP, the LLEAP and their relation to the alterations in reading and writing. Based on the above, the purpose of this study was to characterize the CAP and LLEAP in children with changes in reading and writing. This study was approved by the Ethics Committee for Analysis of Research Projects of Hospital das Clínicas of FMUSP (CAPPesq- Research Protocol nº 305/10). The hearing tests (behavioral and electrophysio¬logical) were performed in 12 children aging between 8 and 12 years old (average of 10,6 years), from 3rd to 6th grades of Elementary School, with alterations in reading and writing confirmed through specific evaluation performed by the Phonoaudiology Investigation Laboratory (PIL) in Reading and Writing of FMUSP. In this assessment the following aspects were investigated: oral language, phonological awareness, operational phonological memory, rapid automatic naming, reading and writing. The inclusion criteria adopted for the composition of the sample were: presence of reading and writing alterations confirmed by specific phonoaudiologic evaluation, normal auditory thresholds (<20 dB NA on frequencies of 0.25 to 8 kHz) and tympanometric curve type A at the moment of the evaluation. After the Term of Free and Informed Knowledge was signed by their parents and/or legal guardians, the children were initially submitted to the immittanciometry, using the middle ear analyzer model GSI 33, of the Grason Stadler brand (version 2-ANSI 1987). Next were performed the tonal audiometry through airway at frequencies from 0.25 to 8 kHz and the vocal audiometry including Speech Recognition Threshold (SRT) and Speech Recognition Index (SRI), using for such the audiometer model GSI 61, of the Granson Stadler (ANSI s3,6-1989; ANSI s3,43-1992; IEC 645-1,1992; IEC 645-2,1993; ISO 389; UL 554). After filling the inclusion criteria, was performed the assessment of the (central) auditory processing in audiometric cabin with recording of the stimuli in compact disc (12), reproduced by a CP Player coupled to the audiometer, presented through headphones. For this purpose was used a standardized battery of behavioral tests, containing temporal tests (which assess the auditory abilities of temporal ordering and temporal resolution), monaural test (which assess auditory ability of auditory closure) and dichotic tests (which assess base figure auditory ability). Firstly were applied the frequency pattern test (FPT) and duration pattern test (DPT), binaurally, i.e., with stimuli presented to both ears at the same time, at intensity of 50 dB NS over the SRT. The next test performed was the Alternative Dissyllabic Dichotic test (SSW), and the Digits Dichotic Test (DD), both applied at 50 dB NS. It was also used the Monaural Test of Speech with White Noise (MTSWN) at +20 dB signal/noise ratio (as standardized for the equipment used), presented monaurally at 40 dB NS intensity. Finally was performed the Gaps in Noise Test (GIN), at intensity of 50 dB NS, with stimuli presented binaurally. In another session were performed the electrophysiological procedures, utilizing the long latency evoked auditory potentials (P300 and Mismatch Negativity - MMN). For this purpose was used the equipment Portable System Model Opti-Amp 8002 of the Intelligent Hearing brand, with headphones TDH-49, being the child comfortably seated in a reclining chair. To the performing of the P300 and the MMN, the disposition of the electrodes followed the international standard 10/20, being the active electrode placed at Cz (vertex), the reference electrodes at A1 and A2 (left and right mastoids, respectively), and the ground electrode (Fpz) on the forehead. There were used tone burst acoustic stimuli at 1000 Hz (frequent stimuli) and 1500 Hz (rare stimuli) at 80 dB NA, presented randomly through headphones TDH-49 in an oddball paradigm, at 1,1 stimuli per second presentation speed, with probability of occurrence of the rare stimulus of 20%. The tests were performed one ear at a time. During the performing of the P300, the children were instructed to pay attention to the rare stimuli, counting them out loud. For the performing of the MMN was used a visual distraction (children's movie) in order to prevent the child from paying attention to the rare stimulus. For the assessment of the (central) auditory processing and the electrophysiological assessment were adopted normality standards established in specialized literature, according to age (12, 13, 14). The individual was considered altered when at least one ear showed alteration, both for the behavioral and for the electrophysiological assessment. The obtained results were submitted to statistical analysis. 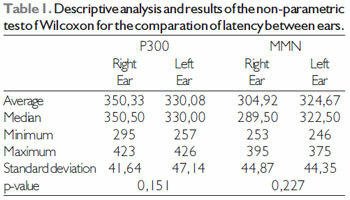 To compare the latencies was used the non-parametric Wilcoxon test, and to verify the association between variables, was used the chi-square test. The significance level adopted was 5%. 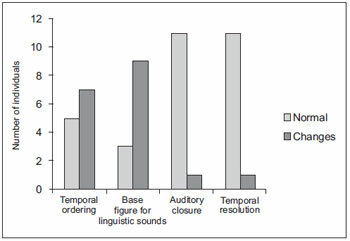 It was observed that 11 of the 12 individuals (92%) presented changes in some abilities of the auditory processing, the most altered being those of temporal ordination and base figure (Graphic 1). 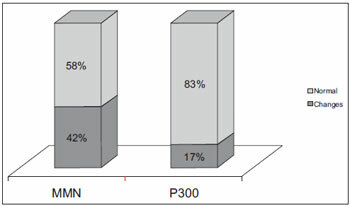 The distribution of the found results with the LLEAP reveals that the children present more changes in MMN (42%) than in P300 (17%) (Graphic 2). The chi-square test showed no association between the performances in MMN and P300 (x²=0,069, gl=1, p-value=0,793). Comparing the results of the electrophysiological and behavioral tests, it was observed that 71% of the children who presented changes at the auditory ability of temporal ordination also presented alterations in some of the LLEAP. Beyond that, 44% of the individuals with changes in base figure also presented alterations in LLEAP. 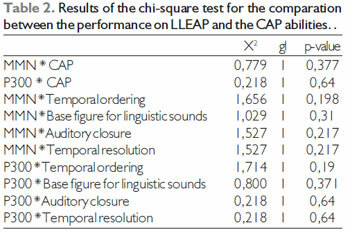 However, the chi-square test revealed no association between the performance in LLEAP and the CAP abilities, as showed on Table 2. Graphic 1. Number of individuals altered by abilities of CAP. Graphic 2. Performance of the individuals at the assessment of LLEAP. The assessment of the auditory abilities have become an important tool to be considered among the range of procedures used at the evaluation of individuals with alterations of reading and writing. Therefore, this study aimed to characterize the CAP and LLEAP in children with changes in reading and writing. The obtained data indicate that it is common to find abnormal results in the CAP evaluation of individuals with alterations in reading and writing, as described by previous studies (15, 16, 17). The abilities of auditory base figure for linguistic sounds and temporal ordination were the most altered, corroborating the specialized literature (2, 3, 7, 18). The deficits in temporal abilities reinforce the hypothesis that such disadvantage might be related to a change on the processing of "short acoustic elements" such as consonants, that are characterized by quick transition of formants, which would lead to a difficulty to associate letters with their specific sounds (8). In a study described in national literature (19) it was observed that the deficits in temporal processing generate difficulties in discrimination, coordination and integration on verbal and non-verbal dominium involving naming, repetition, work memory and long term memory. These results were also observed in another Brazilian research (20) that investigated the abilities of phonologic awareness and of auditory processing in children with and without reading and writing alterations. However, in yet another study (3), the correlation found between reading and CAP was considered weak. One of the supported hypothesis for this finding is that the lower than expected performance in tests of temporal auditory processing may be consequence of factors not considered in the study in subject, such as attention, cognitive abilities and work memory. On the other hand, the base figure deficits may be related to some obstacles faced by the scholar in the classroom. The difficulty in realization of tasks in the presence of noise and competitive sounds can result in difficulty in assimilating the content taught, especially if there are associated memory alterations. Thus, it becomes difficult to the scholar, for example, to understand what the teacher says, besides the stress promoted by the noise situation (21). Moreover, such data reinforce the conception that the scholar with a learning disability presents alteration in the capacity and maintenance of auditory attention, which undermined the base figure ability for verbal sounds (22). That way, it stands out the necessity of studies that seek to correlate the memory and attention abilities to the tests that assess CAP, to obtain more conclusive results. Regarding LLEAP, specifically P300, the small number of alterations found is due, probably, to the great intersubject variability in normality values of this test. Similar result has already been described in national literature (23). Concerning MMN, the data suggest that this test enabled a better characterization of the auditory function of this population. However, it is considered a limitation of this study the small sample, factor that does not allow generalizations. The LLEAP bring important contributions to the investigation of some cognitive abilities involved on the processing of acoustic information (attention, discrimination and memory), skills essential to the proper development of reading and writing (24). It is noteworthy, however, the need of further researches that would allow us to infer on which potential would be better suited to investigate certain abilities of (central) auditory processing, in this specific population. When considering that reading is a particular way of acquisition of information formed by the set of events that take place in time, it is speculated that the integrity of the physiological auditory mechanisms plays a key role in speech perception, learning and comprehension of language and hence is a prerequisite for the acquisition of reading and writing (25). Therefore, it becomes increasingly important to assess the auditory abilities of this population, because such alterations, when detected early, allow a proper orientation to parents and teachers, besides enabling the guidance and intervention of a professional as soon as possible. The subjects with alterations of reading and writing presented performance below the expected on (central) auditory processing. There were also found modifications in LLEAP, and the MMN enabled a better characterization of this population's auditory function. There was evidence of association between changes in auditory ability of temporal ordering and changes in LLEAP. 1) Masters student in Rehabilitation Sciences of FMUSP. Phonoaudiologist from the Department of Physiotherapy, Phonoaudiology and Ocupational Therapy of FMUSP. 2) Doctorate in Rehabilitation Sciences of FMUSP. Phonoaudiologist from the Department of Physiotherapy, Phonoaudiology and Ocupational Therapy of FMUSP. 3) Doctorate in Science in the Experimental Physiopathology Area of FMUSP. Phonoaudiologist from the Department of Physiotherapy, Phonoaudiology and Ocupational Therapy of FMUSP. 4) Free Teacher. Associate Professor of FMUSP. 5) Doctorate. Assistant Professor of FMUSP. Institution: Department of Physiotherapy, Phonoaudiology and Ocupational Therapy of the Faculty of Medicine of Universidade de São Paulo (FMUSP). Article received in 29 of June of 2011. Article approved in 14 of August of 2011.